Peg pot games are great for numeracy practice. 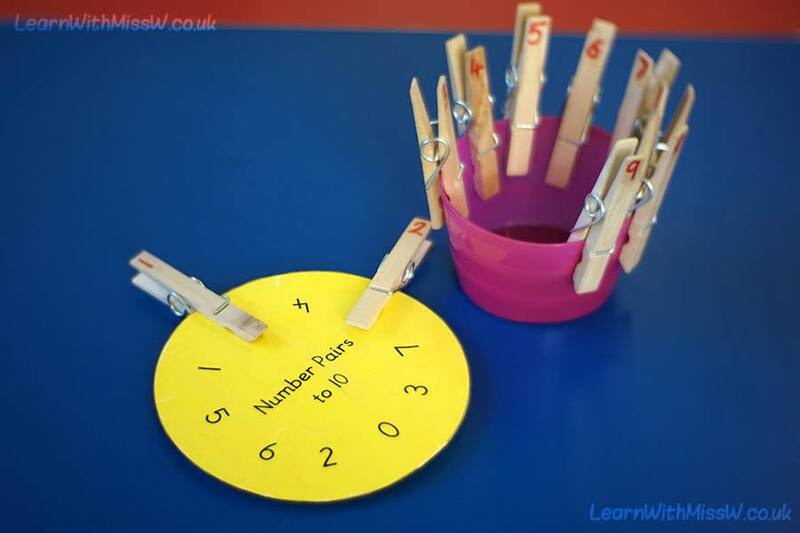 Basically, pegs numbered from 1 to 10 are stored clipped in order round the side of a pot, then children match the pegs onto the correct part of the circle. This pot is for number pairs that match to make ten, so the 1 peg is over the the 9 on the circle, etc. This is a really versatile resources to have. I have made other circles for counting, addition, subtraction and multiplication. Children can play with the peg pots at the maths choosing area and I also use them during active maths stations. I have 3 peg pots and I have matched the colour of the pot with the colour of pen to stop them getting too muddled. To stop the coloured numbers from fading, I put a dab of clear nail polish over each one.